The Mokgoro Enquiry in Pretoria has been told that suspended NPA senior advocate Lawrence Mrwebi never received any bribes nor had any personal relationship with Correctional Services official, Linda Mti. 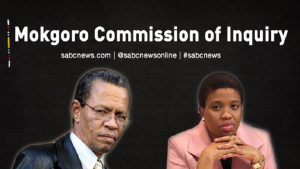 It was recently claimed at the Commission on State Capture that Mrwebi and colleague Nomgcobo Jiba were allegedly paid bribes of hundreds of thousands of rands to prevent investigations into Bosasa’s contracts with the state. Mrwebi is the 15th witness to appear before Judge Yvonne Mokgoro. He has argued that his role on the Bosasa matter was just to accept a report from Anti-Corruption Task Team. He was led by his legal advisor, Mervyn Rip on his first day of testimony. “I know Mr Mti as the accused in this Bosasa matter. I knew him as the Correctional Services DG at the time. Otherwise, besides that, I don’t know him. I have never had any relationship with him of any nature whatsoever. I have no relationship with anybody who knows Mr Mti or close to Mr Mti. I have never met Mr Mti at all,” explains Mrwebi. The post Mrwebi denies having personal relationship with Mti appeared first on SABC News – Breaking news, special reports, world, business, sport coverage of all South African current events. Africa's news leader..